Despite being an incredibly hit-or-miss director over recent years, there was a lot of interest in seeing where Tim Burton, the strange mind responsible for The Ghost With the Most and The Pumpkin King, might take the outlandish fantasy of "Alice's Adventures in Wonderland". 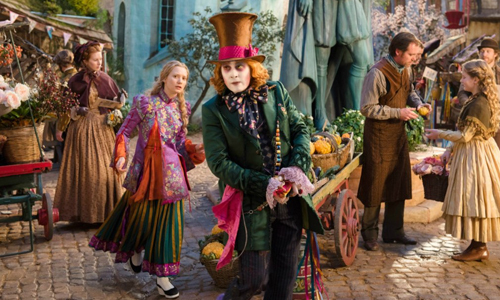 Alas, while Burton's creativity emerged in colorful spurts, the end result dragged on in Alice in Wonderland amid copious amounts of digital wizardry, hallmarked by another peculiar performance from Johnny Depp as the Mad Hatter. Regardless of the critical impressions, the loose adaptation was a box-office juggernaut across the world, which makes it unsurprising that a sequel would come in time. It took six years, but that sequel has finally arrived with Alice Through the Looking Glass, only with The Muppets director James Bobin at the helm in this take on Lewis Carroll's literary universe. Burton's absence and the source material from which the film gets its name could've turned the ship around, yet instead it follows the same monotonous course, feeling every bit like a sequel to 2010's polarizing money-maker only without Burton's minimal flickers of creativity. Again penned by Maleficent's Linda Woolverton, Alice Through the Looking Glass bears the slightest of similarities to Carroll's sequel novel, "Through the Looking Glass": it does feature a mirror through which Alice, played by Mia Wasikowska, walks through to return to the mystical world of Underland. This Alice, however, has seen the world and grown up quite a bit in the time between the events of Alice in Wonderland and the current period, captaining her late father's ship in trade excursions across the globe. In a fit of anger over the schemes of her male financiers and the decisions made by her mother while she was away, Alice sees a familiar face -- the blue butterfly who was once the caterpillar Absolem, which offers a flutter of Alan Rickman's voice -- who draws her back to the mystical world of Underland. There, she learns of the troubles that plague the Mad Hatter (Johnny Depp), which sends Alice on a journey to find the personification of Time, named, uh, Time (Sacha Baron Cohen), so she might right a few wrongs in the past and rejuvenate her ailing friend. 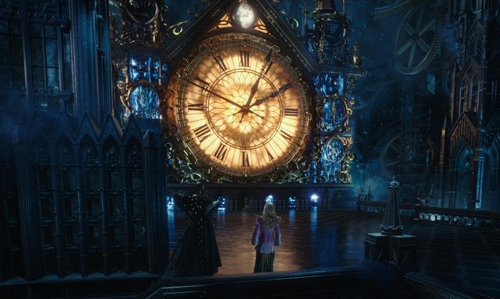 Following a preposterous scene on the high seas designed to showcase Alice's daring and headstrong command of her ship, Alice Through the Looking Glass spends the time before she enters the mystical mirror to project her as a strong, capable heroine who doesn't abide by societal rules and regulations. It's an admirable pursuit, especially considering the impressionable younger audience members, but the combo of Woolverton's script and Bobin's direction telegraph this notion with the subtlety of a sledgehammer, contriving a scenario involving deed ownership and paternal "wisdom" to tear down her pioneering self. Unfortunately, as was the case in the first Alice film, Wasikowska presents little of the spirited presence she so effortlessly displays in Jane Eyre and, recently, Crimson Peak: she shows enthusiasm for her magical surroundings this time around once she's tumbled through the looking glass, but still lacks the enraptured wonder of what seems like old-hat surroundings to her. Her return to such a magical place simply feels like she's walked from one room into another. In her defense, the world of Underland hasn't really changed much since her departure, with her party of friends -- The White Queen (Anne Hathaway), the Tweedles (Matt Lucas), and her furry companions -- all greeting her at almost the exact time she arrives in the wondrous place. From that moment, Alice Through the Looking Glass also falls square into Hollywood sequel territory, shoving forth the familiar faces of the original film as they mostly serve brief, cursory roles in this new story. Abundant digital effects once again adorn the overgrown vegetation and the outlandish creatures of Underland, but there's less inspiration present in the performances that fill out the digital landscape's citizens, even Anne Hathaway's decidedly less-quirky queen. Most notable, of course, would be Johnny Depp's Mad Hatter, whose whistling voice and sheepish demeanor once again render an idiosyncratic fusion of his prior characters. The costumes are gorgeous -- especially Alice's formal Chinese garment -- and the digital effects are broad and encompassing, but the tempo of Underland lacks even the underlying inspiration that Burton brought to the original. Along the way, between meeting Sacha Baron Cohen's lord of Time and discovering what the heck a chronosphere is, Alice Through the Looking Glass transforms into a high-fantasy, steampunk time-travel adventure, hinged on the Mad Hatter's somber past and how it intersects with the bulbous-headed Iracebeth the Red Queen (Helena Bonham Carter). The plot fleshed out by Linda Woolverton's script operates around the "...because I said so" brand of logic, a dunderheaded mixture of easy-to-use technology -- seriously, anyone can activate the chronosphere and know what they're doing -- and arbitrary usage of mirrors as magical doorways. It's a flight of the imagination, probably deliberately so, that's a little too enthusiastic about sending young Alice careening between points throughout Underland's history. The element of time does, however, also produce the film's fleeting moments of winning personality, both in meaningful conversations about the cruelty of the passage of time and some delightfully lighthearted "dad jokes" centered on Time himself. Alice Through the Looking Glass walks and talks somewhat differently than Tim Burton's inaugural chapter, but James Bobin runs into a similar issue to that of his predecessor: despite being driven by chaotic action, vibrant colors, and big personalities, the brief runtime really drags along from start to finish. Maybe it's because the story doubles down on the curious big-headed nature of the Red Queen, giving her condition an explanation that's caused by an incredibly silly and petty course of events. Or, maybe it's because there's so much going on around Alice as she sails throughout the waves of time -- literally -- that the nonsensical forward-motion lulls one into a state of apathy about what'll happen next, or whether it'll even matter due to the presence of time-travel. Either way, Alice Through the Looking Glass continues the trend started by the first journey into Wonderland, unleashing heaps of visible enchantments and whimsy without the genuine spark of magic that'd make this dreamy premise a real curiosity.